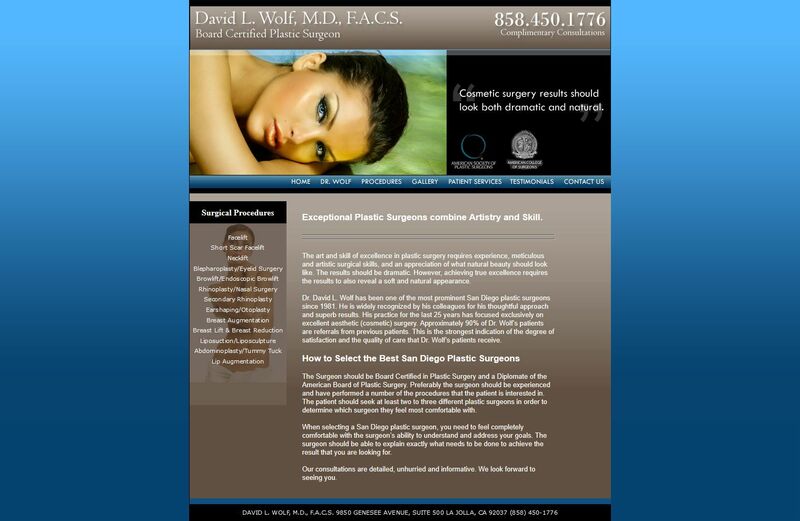 Dr. David Wolf is a prominent cosmetic and reconstructive surgeon based in San Diego, CA. Doctors, dentists, optometrists, chiropractors, and many others in the medical field (including Dr. Wolf) are incredibly skilled individuals, however they are also incredibly busy. Due to their schedule, owners of medical practitioners will commonly outsource web design, SEO, and online advertising to firms like Sandia Digital. Unlike Sandia Digital however, several firms will charge quite a bit for very little. In Dr. Wolf’s case, he was being charged almost $1,000/mo for one minor change to his website per month. Dr. Wolf did not like that at all, and decided to contract Sandia Digital for an update. Upon first look, there were several items that needed to be corrected. 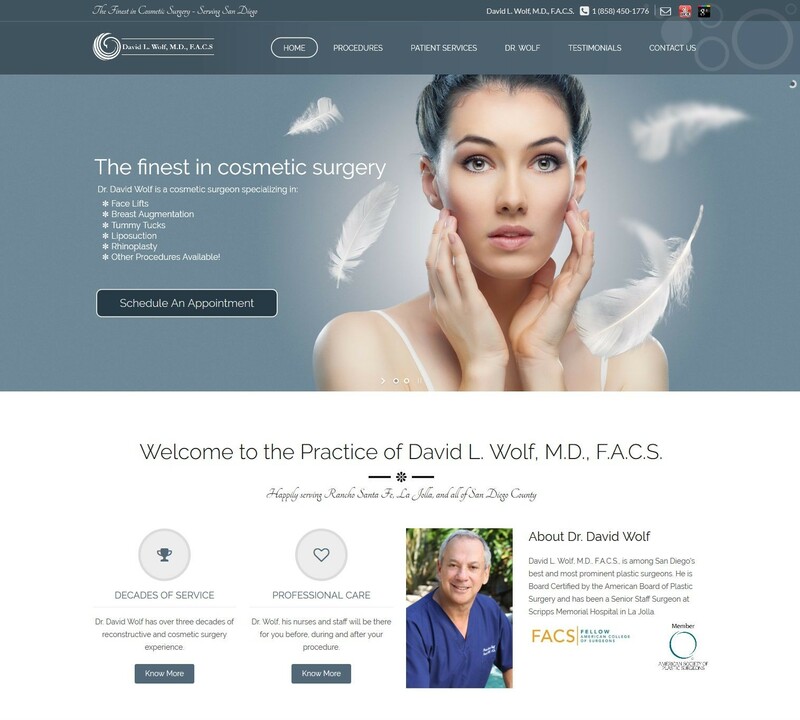 SEO performed to Dr. Wolf’s website was very poor, his website image was very outdated, and his website was difficult for him to administer when needed. Dr. Wolf’s new web design. After coming up with a suitable design, we ported his existing content into the new WordPress platform and set up hosting. Dr. Wolf had a very polished draft of his website within about 3 months, and the website went live not long after making a few minor updates to content and images. Dr. Wolf also pays far less on a monthly basis for much more. Sandia Digital’s plan for Dr. Wolf covers 10hrs/mo for SEO, updates and backups, and we do not restrict you out of your site. Contact us to learn more about our monthly maintenance and SEO packages.